It literally costs thousands of dollars a year to keep this free resource online. Before people put up that kind of money, they have to believe there will be some kind of return on their investment. My site receives an enormous amount of traffic, and I'm handling about 155 requests for information weekly, all as a public service. I constantly add content depending on requests & questions I receive, search terms used to find this website, and student experiences. I fund the website from donations, the stuff I sell in the pilot store (take a look) and the advertising links to the right. So what’s the motivation? It’s simply... to be the best. I want to provide a reasonable service at a reasonable price. For years and years, various companies have put out 2-3-400 dollar training kits and many pilots had lighter wallets for it. While I won’t receive a huge return on my investment, I do want you to browse my website, read the free articles and watch the free videos. In 1969 when the internet was two computers in a UC-Berkeley lab, the intent of the network that this research created was the free exchange of information. This utopian viewpoint brought a nationwide network of government and academic institutions together until in 1993 when the internet connected in the commercial domain and internet commerce was born. I still believe and support the original intent of the internet and that’s the reason a good amount of my training material is freely available at my website. It's an antiquated mindset and that's probably why the website is not a profitable business. 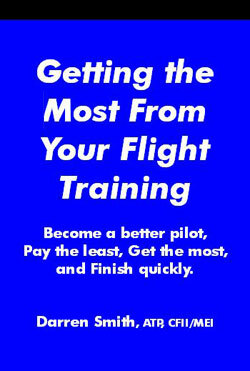 But where you see something that I’m selling, please be readily willing to purchase the item if it will help you progress in your aviation training. The ads on my website also generate funds to pay for hosting and up-keep. Check out some of their offerings as well. And while this meager plea for your support will not generate much revenue, that’s my only return on the investment. There are a variety of ways you can help keep this website online, and keep the articles and videos coming! & see what they're offering.